Fujitsu Siemens Computers has developed the world’s first monitor that requires no electricity at all in idle mode. 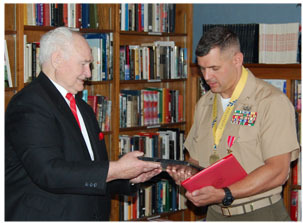 Medal to Lt. Col. Richard P. Faucher Jr. Deployed to Iraq from March 2007 through March 2008 on an economic mission, United States Marine Corps Lieutenant Colonel and Harrington Institute Lean Six Sigma Black Belt Richard P. Faucher knows how to get things done. Tenacity and charisma gave him a strong edge with people, but it was his extensive knowledge and firm belief in Six Sigma that drove the mission. Faucher was directly responsible for building new businesses and rejuvenating existing companies and manufacturing plants in Iraq’s Anbar Province by helping them understand business processes, working around a collapsed infrastructure, defining exact goals, and breaking down cultural barriers. His methods proved so successful that he received a Bronze Star and a Harrington Excellence Medal. The first step was the Anbar Economic Conference, an event that brought coalition forces reconstruction teams, the U.S. Agency for International Development (USAID), and other U.S. and nongovernmental organizations together under one roof to define problem areas. Faucher immediately segregated them into groups and started asking questions. By the end of the conference, the leaders had developed a list of actions that would enable them to overcome perceived obstacles to economic development. Faucher was instrumental in the rejuvenation of state-owned enterprises, in particular the Ramadi Ceramics factory and the Al Ikaa manufacturing plant. Faucher made site visits, did extensive background research, conducted numerous interviews, and was able to identify shortcomings related to management, supply chains, and the use of technology. When the Al Ikaa manufacturing plant, formerly used to manufacture artillery components, was first assessed, two obstacles to rehabilitation were immediately apparent: the plant required a $4.2 million renovation, and there was no coherent plan for getting the factory operational again. Faucher then coordinated the renovation required to make the plant capable of manufacturing metal parts for various industries. These parts are currently imported from Jordan or Kuwait, so enabling their manufacture in Anbar Province will have a significant effect on the provincial economy, especially since the plant is expected to employ more than 4,000 Anbaris when it is at full capacity. Faucher also worked with USAID on the development of microfinance offices to work in tandem with small business development centers in Fallujah, Ramadi, and Al Qaim. These offices specialize in providing investment capital and business training to both new and expanding small businesses, and they were the first such offices established in Anbar Province. An Anbari nongovernmental organization was established to oversee microfinance operations. Even though Iraq considers itself a secular country, the people still follow Islamic religious edicts, called fatwas, which meant that Faucher needed to meet with Anbari political, tribal, and religious leaders to create understanding and overcome initial opposition. Last month in “Do the Math,” we sent you to manufacturing.net to find the error in the article, “Motorola: Icahn Lawsuit an ‘Unnecessary Distraction.’” The story, from the Associated Press, discussed billionaire investor Carl Icahn’s legal efforts to force Motorola to turn over documents about its executives and its cell phone business; Icahn is trying to win four seats on Motorola’s board. As most of you pointed out, the “million” is redundant, otherwise Icahn would be a very rich man. Or, doing the math, 142,362,000 × 1,000,000 = 142,362,000,000,000 shares. At, let’s call it, $10 per share, Icahn would be worth about $1.14 quadrillion or, as reader Keith Nicholson noted, “more than 100 times the national debt.” Hey, do you think if we politely asked, Icahn would… nah. Our winner of this month’s “Do the Math” is Joe Gliksman. Joe wins a glorious prize from woot.com. This month’s puzzle was submitted by Derrell S. James and is less a math error than a writing error. The author misquoted a press release and changed its intended meaning. It’s easy to do. To find this error, go to www.mpo-mag.com/articles/2007/11/plan-to-prosper. If you think you have found the error, send it to us by clicking the feedback link at the bottom of this page and you may win a prize. Do you think you’ve found a great example of math murder in the media? Send it to us by clicking the feedback link at the bottom of this page and you may win a prize, too. How do executives achieve truly exceptional results fast? 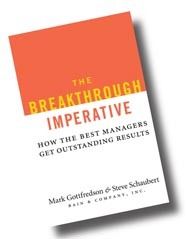 In The Breakthrough Imperative: How the Best Managers Get Outstanding Results (HarperCollins, 2008), Mark Gottfredson and Steve Schaubert help readers understand four straightforward principles that will help readers achieve breakthrough results: costs and prices always decline, competitive position determines options, customers and profit pools don’t stand still, and simplicity gets results. The authors interviewed more than 40 CEOs from both industry and the nonprofit sector, conducted an intensive study of what successful managers do right and what unsuccessful ones do wrong, and drew on their own combined fifty-plus years of experience at Bain & Company to come up with these four principles. The authors conclude that by mastering these four laws, executives will create a foundation on which to build the rest of one’s management strategy. For further information, visit www.harpercollins.com/books/9780061358142/The_Breakthrough_Imperative/index.aspx. 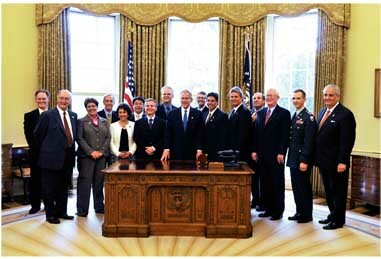 President Bush met with the Baldrige Award winners at the White House. On April 23, 2008, commerce secretary Carlos M. Gutierrez presented the 2007 Malcolm Baldrige National Quality Award, the nation’s highest honor for organizational innovation and performance excellence. The award winners were PRO-TEC Coating Co.; Mercy Health System; Sharp HealthCare; and two nonprofits, the City of Coral Springs, and the U.S. Army Armament Research, Development and Engineering Center (ARDEC). The ceremony, the 20th in the history of the award, honored the 2007 recipients and marked the first year that nonprofits were eligible to apply for the award. “Quality, innovation, and competitiveness are essential to America’s global leadership. Each of the five recipients we honor here today has developed an innovative approach to performance excellence that benefits their organization, their community, and our nation,” said Gutierrez. The recipients were selected from among 84 applicants. Their applications were reviewed during a six-month period, including an on-site visit by a team of volunteer experts. An independent board of examiners evaluated the applicants in seven areas: leadership; strategic planning; customer and market focus; measurement, analysis and knowledge management; human resource focus; process management; and results. President Bush met with the winners informally to congratulate them at the White House earlier in the day. Further information about the Baldrige Award is available at www.baldrige.nist.gov. At the same hearing, reported by the Chicago Tribune on April 30, David Strunce, chief executive of Wisconsin-based Scientific Protein Laboratories LLC (SPL), the supplier of the materials used to make Baxter’s heparin, admitted that the company has no way of tracking which of 12 different suppliers might have introduced contamination into the heparin supply chain. SPL operated the now-closed plant in Changzhou, China, that obtains the raw material for heparin, which is derived from pig intestines, by purchasing bulk materials from village workshops and rural pig lots in China. Strunce claims that Chinese regulators have interfered with his company’s efforts to determine the source of the contaminating material. Oversulfated chondroitin sulfate is a more cheaply produced derivative of cartilage and is not a naturally occurring compound. The hypersulfated version is a very heparin-like molecule. Compounding SPL’s alleged difficulties with tracking the source of the contamination was the fact that five months prior to the Food and Drug Administration (FDA) conducting a five-day inspection of the Changzhou SPL Co., and subsequently reporting myriad procedural and quality violations, a Baxter representative had given the plant a one-day “snapshot” inspection and passed it as a safe source of material for Baxter. All of this tragic rigmarole begs the questions: How can U.S. medical manufacturers be sure that their imported ingredients meet quality and safety standards, who should be responsible for verifying that quality and safety, and how far down the supply chain should quality auditors be obligated to go when verifying the quality of basic ingredients? Ideally, one would expect any company to run rigorous tests of all raw materials before using them and to apply the same rigor in testing its finished products before releasing them to an unsuspecting public. More than three-quarters of audit committee members who took part in a recent survey commissioned by the Center for Audit Quality (CAQ) rate overall public company audit quality “very good” or “excellent,” and 82 percent say that it has improved in recent years. The internet survey of 253 audit committee members offers an unprecedented look at the views of key players in the fight against corporate fraud--corporate board members who oversee the preparation and auditing of public company financial statements. The findings indicate that even in the face of market turbulence, audit committee members have high confidence in the quality of audited financial statements and consider the Sarbanes-Oxley Act (SOX) a positive influence. Audit committee members indicate that they believe the risk of fraud and materially inaccurate statements is low due to tightened internal controls. “The findings confirm that public company audit quality is high and has only gotten better in recent years, according to the people closest to the process,” says CAQ executive director Cindy Fornelli. To view the survey questionnaire and complete results, visit www.thecaq.org. More than 50 percent of midsized companies have either already implemented a formal operational excellence strategy or are in the process of developing one, according to a global survey of 946 senior executives in operations, information technology (IT), finance, marketing, and sales completed in January 2008 by the Economist Intelligence Unit. The most important element of operational excellence, according to the respondents, is end-to-end visibility across the value chain, ideally in real time. The survey found that companies that have already implemented an operational excellence strategy see it as a driver of growth, rather than simply a way of holding down costs or promoting efficiency. The most effective companies also use it to aggressively pursue market share during economic downturns when many of their competitors are focused on cost-cutting. Operational excellence supports organic growth and is a means of achieving two objectives that promote organic growth: anticipating emerging customer needs and identifying the core skills that underlie competitive advantage. The more experience a company has with operational excellence, the greater the benefits. About 25 percent of companies with formal strategies were able to reduce costs while simultaneously improving customer service, claimed executives who responded to the survey. The survey notes that operational excellence helps companies recognize gaps that can be filled by acquisitions. Other findings include a broad horizontal approach toward improving efficiency. More than 70 percent of companies surveyed say that they are improving efficiency by systematically evaluating and improving business processes at the functional level (i.e., human resources, finance, operations, and IT). The second-ranked approach is to improve systems and processes to make employees more efficient, for example by providing role-based dashboards. More than half of respondents identify more effective alignment of skills with emerging business needs as an efficiency-improvement priority. Few companies have achieved the ultimate goal of real-time end-to-end visibility across the entire value chain, but many have made substantial progress. Visibility into operations helps to give companies the agility needed to move rapidly. For more information, visit www.eiu.com/sponsor/sap/opex/. On page 50 of our May issue, under “Viewpoint: Engage With China,” by Stanley Chao, the web address under “About the author” should read www.allinconsult.com. We regret any inconvenience this error might have caused. The International Organization for Standardization (ISO) and the Institute of Electrical and Electronics Engineers Inc. (IEEE) have signed an agreement to increase their cooperation in developing international standards. The agreement will initially focus on information technology, intelligent transport systems, and health informatics. The partner standards development organization (PSDO) cooperation agreement provides new opportunities to adopt and jointly develop international standards to serve the global marketplace. The PSDO cooperation agreement between the two organizations aims to optimize stakeholder resources in the development of standards where both ISO and IEEE have expertise, and to shorten time-to-market. The agreement facilitates processes for the joint development of standards and for adopting each other’s standards. For further information, visit www.iso.org. Quality Digest is proud to announce the debut of a new and vastly expanded web site that includes the power of streaming video content. The new site, which goes live on July 1, can be found at www.qualitydigest.com. Regular content includes interviews, commentary, “how-tos” and best practices, event coverage, and industry news reports. Short videos of five minutes or less in length, many originally produced by Quality Digest , will be featured on each of the site’s six communities-- Quality Insider, Inside Metrology, Inside Standards, Inside Six Sigma, Inside Health Care , and Inside FDA Compliance. Articles, columns, and news items from the pages of Quality Digest magazine and the various Quality Digest e-newsletters will still appear on the web site. Well-known and frequently used resources such as the ISO database, the events calendar, partner web links, the state quality awards recap, and the buyers guides will also remain available. For more information, visit www.qualitydigest.com.